Oculus founder Palmer Luckey claims the extra hardware won't significantly increase the final price of the unit. Oculus has unveiled the latest prototype of its Rift virtual-reality headset at this year's CES. 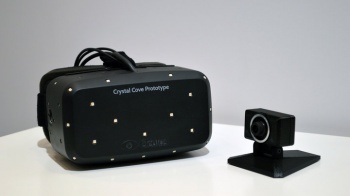 The new prototype, dubbed "Crystal Cove," will feature a full OLED display, that features low persistence for less motion blur, as well as a positional tracking camera that will come bundled with the headset. Oculus founder Palmer Luckey said that despite these additions, the consumer price of the unit won't significantly increase, as being affordable is the company's number one goal. "Cost has always been at the crux of the entire Oculus platform, if the hardware is not affordable, it might as well not exist. We made sure this is a low-cost solution without sacrificing any quality." Nate Mitchell, the VP of Product at Oculus, told Polygon a little more about the positional tracking camera. The camera will be included in the cost of the hardware, and will not be a separate purchase. It will add an extra three degrees of movement to the Rift, allowing the player to move their head in 3D space. As for the OLED, Luckey said that "[the] new OLED panel in the prototype switches in well under a millisecond, so it's faster than any LCD monitor on the market," but didn't offer any additional details on what resolution the screen will have. "Low persistence is really, really important. It's probably the most important thing we're showing. It doesn't sound really exciting... but it's incredible the difference low persistence makes," Luckey added. "You really have to see it. It's mind-blowing." On the one hand I can respect the company's decision to make sure the Rift is absolutely 100% perfect before putting it out there, but on the other hand I want one now!